Delightfully charming and easygoing, one can’t help but smile at hearing a young voice not far from 30 that is reminiscent of times that have long passed. With long, dark hair and a spirit of light, she exudes cheerfulness, smiling from ear to ear as she snaps her fingers, bobs her head, and scats to the beat. Truly an old soul, it is clear that vocalist and songwriter Sarah Marie Young not only loves music, but she lives in it. “I’ve never had the goal to be real famous, but I love performing,” Young humbly states. From an early age, Young grew up knowing that her life would have something to do with music. Born and raised in Indianapolis, Indiana, music was in her blood. Her mother was a singer from the Philippines, and her father was a bass player from Chicago. A huge part of her upbringing was church and the music she grew fond of that filled those spiritual walls. “The church I grew up in was one of [those] churches you were [in] there all day and all night. And the pastor was from Kentucky, so he was kind of a Southerner,” Young says as she recalls the weekend ritual. Having spent much of her time in the Baptist church, gospel music had an enormous impact on Young as a singer, aside from more secular tunes from icons such as Stevie Wonder and Marvin Gaye, who were equally played in heavy rotation. She cites the prominent gospel group the Clark Sisters and Aretha Franklin’s spiritual melodies as influences early on. More significantly, it was her father who inspired her the most as a musical artist and a survivor. She saw firsthand what it was like to dedicate oneself to being a full-time musician; honing the craft, never giving up, and humbly sacrificing. After her parents divorced, she and her siblings resided with her father. Although circumstances of hard times affected Young during her youth, which included her parents’ divorce, she played with the hand she was dealt, which has contributed prominently to her outlook on life today. Having to help support the family, Young, her older sister and brother, all got jobs at an early age; Young as soon as she turned 14 began working at Hallmark. Even with unfortunate circumstances — that being her parents’ relationship and financial hardships — she appreciates her childhood for what it was. “My dad was a huge part of my life and my desire to be a musician; it was just the way I was brought up. I was privileged in some ways, and then not in others, but I feel like I had a balance growing up and knowing what was important,” she explains. Fast forward to the present, Young has made a name for herself in the Chicago and international jazz scene. 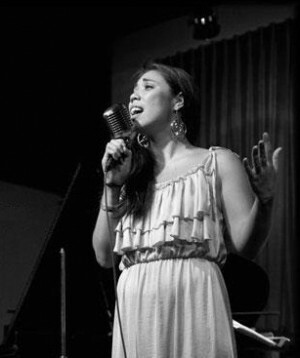 In 2010, she was a semi-finalist at one of the world’s most prominent, if not the most, jazz competitions, The Thelonious Monk International Jazz Competition for vocalists held in Washington, D.C. More recently, in July 2011, she was the first place and public prize winner in the Shure Montreux Jazz Voice Competition, part of the esteemed Montreux Jazz Festival in Switzerland. There she met living music legend, Quincy Jones, just part of what amounted to one of the best musical experiences of her life. She recalls being out on stage and singing, erasing the thought in her mind that the performance was part of a competition. She was more aware of the pinnacle nature of that moment and the once in a lifetime opportunity that was happening. With the crowd’s engagement and supportive vibes, she made the decision to just have fun with it, instead of worrying about the preconceived notions and acclaim of a contest. “They were such a welcoming audience and you could feel the energy from them like they wanted you to do a good job,” she adds smilingly. Young has just returned from recording her first full-length original album, Too Many Februaries. As the Montreaux Jazz Voice Competition winner, she was able to go back to Switzerland at The Balik Farm studios and record with her band, which was an experience in and of itself, according to the jubilant artist. Sharing some of the secrets behind the album, she talks humorously about how much time she and the band spent together while they were there, being that they were quite literally in the middle of nowhere, or as it is otherwise known: the village of Ebersol, with no common luxuries on hand. No television, computer, or connection to the outside world. “We’d cook dinner and then sit in a circle. And we’d only spent the entire day in the studio together,” she says.